RTA – The Road and Transport Authority have launched five new apps (and a website) that offers as many as 30 new services to customers. This is a big positive step towards establishing Dubai as a Smart City. Every app is available for free download across Android, iOS, Blackberry and Windows platforms – which is commendable for launching a new app. RTA’s new applications cover five different verticals: Drivers and vehicles smartphone app; smart parking app in Dubai; Salik smart app, which enables customers to inquire, top up balance, and display trips; a useful public transport app; and a business services app which enables businesses to review tenders, request placing ads, rent metro outlets and more. All of the apps are working across mobile devices and tablets. The apps need separate downloads but one can access each or all of them via a common login – username and password. Mattar Al Tayer, Chairman of the Board and Executive Director of the RTA, unveiled the launch of the new package of smart applications which enables users to complete their transactions via smartphones. He said ” “Launching these apps comes in implementation of the initiative of His Highness Shaikh Mohammed bin Rashid Al Maktoum, Vice-President and Prime Minister of the UAE and Ruler of Dubai, to transform Dubai into the smartest city of the world within three years,”. “The key smart services which will be launched are the vehicle ownership renewal service, driver’s license renewal, payment of fines, issuance of vehicles/drivers-related certificates, recharging NoL cards, checking NoL balance, in addiction to launching the second generation of the m-Parking service, which enables motorists to pay their parking permit via text messages or credit cards” the RTA has announced. One of the most useful apps will be the smart parking app which will have drivers given directions to the next available parking slot in the area. Sensor technology will be used to locate free parking spaces. 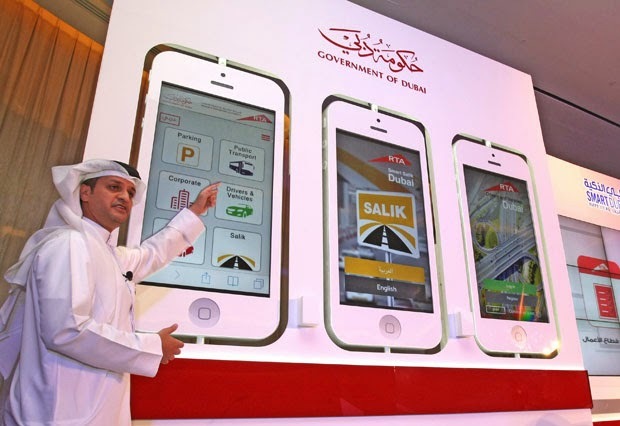 The Salik app will allow for balance inquiry, trips display and vehicle enquiries made directly via the app. With the unveiling of the latest apps this week, RTA now have 53 smart apps for the public. The initiative is aimed at ensuring that government services will be accessible, quick and efficient through the use of hi-tech smart devices. The project is expected to enable the public to transact with government departments using smartphones any time, any day of the year. With more than 70% of Dubai on smartphones, and a large number of people having access to the internet, this move by RTA is a great step towards establishing Dubai as a leading smart city globally. With the plans that the forward thinking leadership have towards achieving this goal (see post earlier (Plans to make Dubai a smart city), it sounds positive. With those on data plans it’s an easy jump into the digital world. Those who rely on available wifi at home and work, they’ll have to wait a bit as the entire city slowly becomes one large free wifi zone! You can keep track by following #RTA_Dubai.